Former Assistant District Attorney David Puckett has opened a law office in Woodbury. 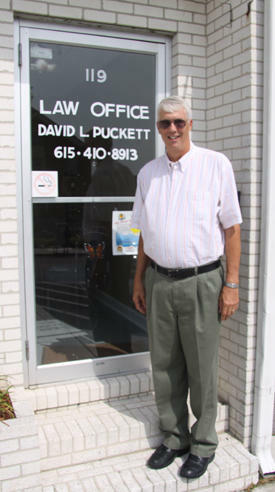 David Puckett served as the Assistant District Attorney General for the 16th Judicial District, which includes Cannon County, for 22 years. Puckett, who resigned in June, 2011, has changed roles but remains in his lifelong profession and one that he says he loves because "it allows me to help people." The former prosecutor has opened a private law firm in Woodbury and now serves as a defense attorney. "I've always thought that once I retired as an Assistant District Attorney I would like to open a small private law office in Cannon County. I know a lot of people here," Puckett said. "I want to keep my relationships with my friends here. "I just want to try to help people when they get in trouble in (Cannon County) General Sessions Court. I think everybody looks for the truth in any case and they want justice. It is different but as long as justice is done I think everybody would be happy." Puckett said his practice is open Tuesdays and Thursdays. "I really just wanted to handle some minor things," Puckett said. Puckett's speciality is criminal law. He has practiced it for the 30 years since obtaining his law license in April, 1983. In October of that year he was hired as the District Attorney's Criminal Investigator for the 21st Judicial District. Puckett already has been involved in several cases through his private law office. He noticed one major difference when he was recently in court. "I was in General Sessions Court and I looked out and saw a lot of people I recognized," Puckett said. "I was so thankful I didn't have to deal with all of those cases. It was like a breath of fresh air that I just had to deal with my case." Puckett will have more time on his hands and he can be selective when it comes to which cases he wants to defend. One thing remains a constant - Puckett desires to work hard representing the citizens of Cannon County and remaining visible around the town in which he worked for more than two decades.